at the Nebraska Heart Institute in Lincoln. Vanessa was born in David City to Frank and Mildred (Koskan) Kaspar) on June 27, 1935, and raised in several towns including Newman Grove and Grand Island, she entered Lincoln General Hospital School of Nursing on February 14, 1954 and graduated August 24, 1956 as a registered nurse. Nursing was an integral part of her life and caring for the sick and aged gave her much joy. She worked at the Butler County Hospital, even assisting in the delivery of her son-in-law, Chris. The majority of her career focused on geriatrics with employment at David Place, St. Joseph’s Villa and Schuyler Care Center. She had great advice and would share it with a twinkle in her eye… Be stubborn. There is reward in a job worked hard and done well. Dish water need be hot, soapy and with bleach. Use a dish rag that is not too thin or too thick. Sit and enjoy your coffee in good company. Burnt toast makes you beautiful. Don't be in such a rush. Check the ground behind you before you drive away; you may have dropped something. Everyone could use a baby wipe to clean their hands at a restaurant, even a grown man. Laugh at yourself. Grow and keep beautiful flowers. A dog needs a good, long walk (and often) and It's perfectly acceptable to eat a cherry nut ice cream cone at 8:00 in the morning. Family members include her brother Vernon (Martha) Kaspar of Houston, TX; daughters Gina Hasselquist of Pocatello, ID and Jamie Kabourek (Chris) of Lincoln, NE. 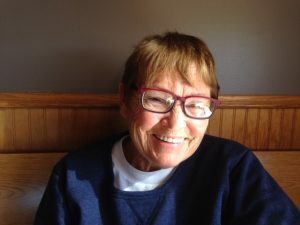 Her six grandchildren include Megan (Craig) Palik of Lincoln, NE; Hannah Hasselquist of Portland, OR; and Libbie Hasselquist of Omaha, NE (daughters of Gina Hasselquist) and Aidan (12), Samuel (8) and Charlie (5), sons of Chris and Jamie Kabourek. Great-grandsons include Liam (4) and Oden (2), sons of Megan and Craig Palik and Milo (9) and Oliver (3), sons of Hannah Hasselquist. She was preceded in death by husband Jim Zegers; favorite sister Virginia (Ginger) Petrie and parents Frank and Mildred Kaspar. Celebration of life: 4 p.m. Tuesday, November 22, at Kracl Funeral Home, David City followed by a light meal at Winfield’s.